Where do I begin with this beauty? This 1953 Lincoln is 1 of just 17 graded by NGC with just 2 graded higher- 1 in 68 STAR Cameo and 1 in 69 Cameo! 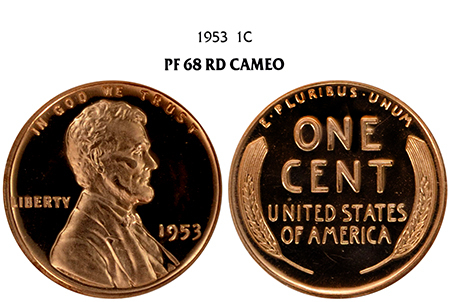 "Box Era” Proofs are very difficult to find with clean surfaces and black-and-white contrast, so this 1953 is an extremely rare find among all Proof Lincolns! This 1953 offers scarce, frosty-white devices on deep mirrors for gorgeous black-and-white contrast. The fields are free of haze, toning, carbon spots, and blemishes- this beauty is virtually flawless! I’m proud to be able to offer such a phenomenal 1953 Lincoln in my Everest series!